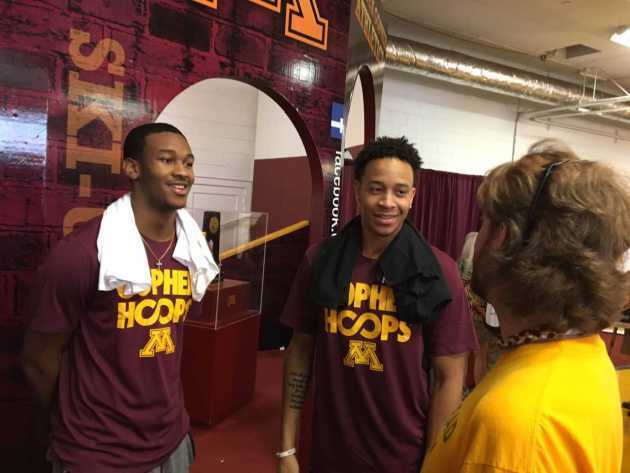 Video (03:34) : Gophers sophomores Eric Curry and Amir Coffey and coach Richard Pitino talk Monday at the Minnesota State Fair. Praise came pouring in for the Gophers men’s basketball team after a national-best 16-game turnaround last season. But Minnesota’s players won’t be satisfied with just a high finish in the Big Ten and reaching the NCAA tournament. Curry and sophomore guard Amir Coffey greeted and signed autographs for fans Monday at the Minnesota State Fair. In a Q&A with the Star Tribune, they both talked about improving their shooting this summer, lofty expectations for next season and more. Q: Coach Pitino talked about you and Jordan Murphy as being two of the most improved players this summer. What have you worked on the most? EC: Coach Pitino had a sit down talk with me before we were released this month. He just told me I would be a real hard player to guard if I was able to knock down the three ball consistently. He’s seen that from last year. So I’ve been working on that a lot. I think it will really help us out this year if I’m able to shoot the ball well. Video (03:34): Gophers sophomores Eric Curry and Amir Coffey and coach Richard Pitino talk Monday at the Minnesota State Fair. Q: You played a lot as a freshman at both power forward and center. What do you think your role will be this season? EC: Me being able to play two positions last year will help out this year as well. Coach P has been talking about me playing a lot of (center) this year. I should be able to be a mismatch at the five position with my speed, size and skill. That comes in handy. I know the expectations are high for the fans and from him for me, so I want to be able to live up to it. Q: Is there an area where the frontcout can improve as a whole, especially at forward? EC: Defend more. Lock up a lot of guys. Last year a lot of guys got their career highs on us. So locking down those premiere guys in the post is going to be fun this year. Q: How much of a battle has it been with (All-Big Ten forward) Jordan Murphy in practice this summer? EC: That's every practice, every day since summer last year. It's pretty fun guarding him every day. (Amir asked who usually wins those battles?). Murph (Curry laughs). Murph has developed a jumper as well. So that's going to help out a lot. People already can't guard him in the post as it is. So him stretching his game is going to be hard for people to guard him even more. Q: You played your last two season of high school basketball at Southwest Christian in Arkansas. What will it be like to play with the Gophers in Fayetteville this season? EC: I’m going to know everybody in the Arena that night. Everybody is probably going to hate my guts. But it’s going to be pretty fun going there and playing in front of my friends I made when I was in Arkansas. I was there for two years. Q: So what’s up with buzz cut and getting rid of all your big, frizzy hair from last year? EC: My mom actually cried when I cut my hair. She was in tears. But I just felt like it was getting irritating. It was all in my face. I couldn’t make a couple shots and I couldn’t make some layups during the games. I just wanted a new look. I’m feeling older now. Q: How was it getting to play in the Twin Cities Pro Am with other Gophers teammates this summer? EC: It was pretty fun just showcasing our skills and what we’ve been working on all summer. Showing the fans how much better we’ve got. So it was pretty cool. Q: What was it like competing at the Nike Academy in California last week? Amir: It was a really good experience. There were 20 college players and 25 high school players there. We got to work out with NBA guys and former NBA guys were our coaches. It was a good experience and it allowed us to showcase our talent. There were a lot of good players there of all different classes. You just had to play your game and show your strengths. And during the drills you had to work on your weaknesses. Q: Did this camp make you think about possibly playing in the NBA in the near future? Amir: That’s what the camp is for. To get on their radar. There were a lot of scouts there and GMs there for a lot of NBA teams. It just gives you a chance to get your name out there, show what you can do and what you’re good at. It gives them a chance to see what your strengths and weaknesses are. That’s basically what the camp was for. Q: What area of your game did you work on the most this summer? Amir: My shooting ability is one of the main things I’ve focused on this summer. I think I showed that well down there (at Nike camp). Stepping up and hitting from three-point range. My dribbling was something I’ve worked on and my strength as well. I’m weighing a little over 200 pounds. That’s a good weight for my position at the next level. Q: There are early preseason rankings with the Gophers consistently as a top-20 team. Are you guys talking about that as a team? Amir: It really doesn’t change anything. Rankings top 15 or top 10 really don’t matter. You still have to play every game no matter who you’re playing against. It doesn’t change anything. It just raises the stakes a little bit.